Any travel experience is incomplete without it’s true culinary flavors and Czech Republic/Czechia is no exception. Czech Republic might appear like a small country, but they easily have some of the most delicious local cuisine. One of the signature Czech delicacy, this can never go wrong in any restaurant, in any part of this country. Confit of Duck leg or Roasted Duck is traditional Czech dish, enjoyed especially in the holiday season. This dish comprises of a well roasted duck leg served with a large portion of red cabbage and the traditional potato dumplings to go with. A glass of Moravian wine is just perfect to wash it down with. Another Czech Special dish, the pork belly is roasted slowly and braised to perfection and is served with garlic or spinach dumplings. Since the Czech love dumplings, you can definitely look at a variety and choose the one that pleases you! Czech isn’t too big on sea food, but the towns that have rivers passing by usually include the local trout fish in their meals. This bony fish is grilled to perfection after mixing it with local herbs and spices along with baked vegetables as the stuffing. 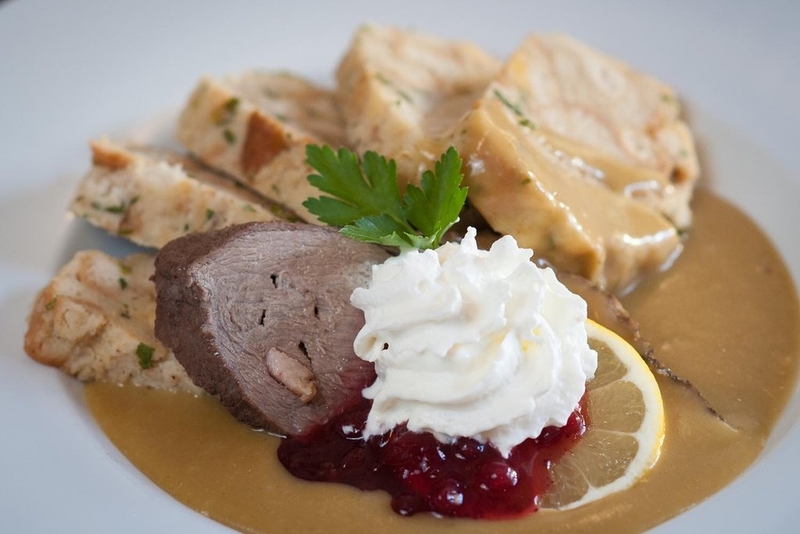 Binge on it with a glass of Moravian wine and you’re all set with that meal! The Creamy Chicken Paprika is a popular poultry dish in Czech towns served with the staple Potato Dumplings. Arguably, the Chicken Paprika is less Czech and more of a Hungarian Goulash, but that’s how the Czech like it and wish to call it their own. Czech Potato Soup is their version of vegetarian. Unfortunately for vegetarians, this soup has taw eggs added in the end to better the taste. You truly can and must enjoy this local flavored soup by requesting your chef to refrain from adding eggs. Now Potato Dumplings are a part of every European cuisine. Obviously, it has a local twist in every region. The Czech/German Potato Dumplings are often served as a side dish with main courses like Confitted Duck, Roast Pork Belly, etc. If you’re a vegetarian in Czechia, Fried Cheese will be one of your few options to local eats. Not the most tradition Czech dish, this is available across the country’s restaurants as the non-meat options for tourists. Fried Cheese is what you can call the vegetarian heaven. If you’re not really the one for salads, you’re sure to find friend cheese all across Czech Republic.Other than the fact that it’s some great fresh cheese, it tastes absolutely delish! It comes with a serving of Tartar sauce or an additional dip in most restaurants. Before relishing the Tartar Sauce or any dip that you get along, ensure there is no egg used for preparations. Pilsner variants, with Pilsner Uruquell from Czech being the numero uno are the perfect drink to go with any meal! Budwiser Budwar, Kozel, Gambrinus are some of the popular beers. Beers are an integral part of traditional Czech meals, they’re equally celebrated by locals and tourists alike and are available at less than a Euro. There are also many breweries that offer a range of local varieties and are worth checking out! 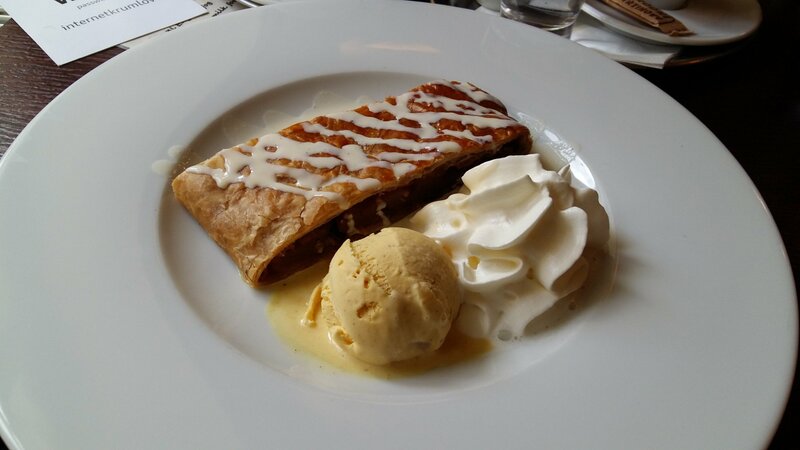 A Czech dessert, found majorly in Prague. Tredlniks are sweet breaks with chocolate/ ice cream/ fresh cream fillings. These can be devoured at anytime of the day. We had it for breakfast in Prague. Strudel’s are definitely more Austrian than Czech. But what makes strudel special here is the way they make these tiny pasteries with Apple/ Blueberry stuffings that easily melts in your mouth. It’s a dessert. It’s sweet. And yes, it contains egg! But well, IT’S DELICIOUS! There is a major influence of the Hungarian and Slovakian cuisines in the Czech culinary trails, especially the Hungarian Goulash. Recommendations for Czech Special Food Experience: Zlata Hvezda in Litomosyl, Depo in Cesky Krumlov, U Pavouka in Prague. Let us know which of these dishes would you like to try or if there’s anything that we haven’t tried but should when we go there next!